The greatest golfer in history is gone. North Korean dictator/superstar golfer Kim Jong-Il has died at 69 -- a fitting age, because 69 is under par on every regulation golf course. 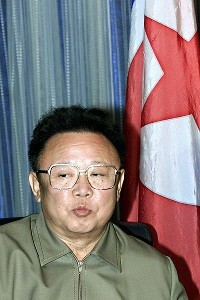 Associated Press Kim Jong-Il never needed a swing coach to master the sport of golf. Kim shot 38 under, including 11 holes-in-one, at the 7,700-yard championship course at Pyongyang in the VERY FIRST golf round of his life, according to North Korean state media. This was in 1994, when Kim was 52 years old. Even more impressive, Kim stood just 5-foot-3, yet he was able to overpower a course as long as any ever played in major championship history. Who knows how good Kim could have been if he had taken up the sport earlier? Who knows how many times he bested 38 under in the 17 years since his first round? What we do know is that no matter how many more majors Tiger Woods does or doesn't win, the debate of Tiger vs. Jack is really an argument about who is the second-best golfer in history. More than his undisputed greatness on the course, it's probably Kim's simple approach to the game that will be his enduring legacy. While other great golfers have written books full of tips, tricks and swing thoughts, Kim had the best approach to conquering the sport of golf: Have your national propaganda department lie for you. Try it out the next time you hit the links!